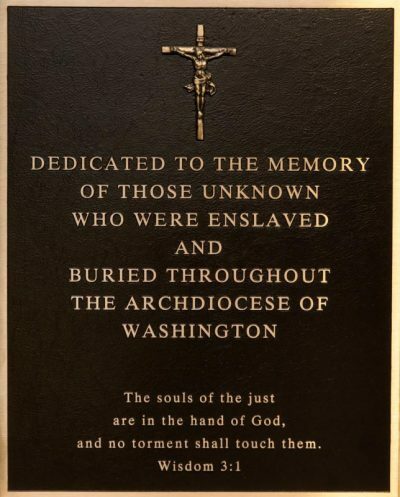 WASHINGTON (CNS) — Saying the time had come to “right a wrong,” Cardinal Donald W. Wuerl blessed and dedicated commemorative bronze plaques honoring unknown enslaved men, women and children buried throughout the Archdiocese of Washington. Washington’s archbishop sprinkled holy water on the plaques during a Feb. 3 Mass at the Basilica of the National Shrine of the Immaculate Conception. During Mass, the plaques were temporarily put in the lower sanctuary of the national shrine. By this spring, the plaques are to be placed in the five major cemeteries of the archdiocese, which covers the District of Columbia and five surrounding Maryland counties. In addition to Mount Olivet Cemetery in Washington, the archdiocese has two cemeteries in Montgomery County, Maryland, and one each in St. Mary’s County, Maryland, and Prince George’s County, Maryland. The Mass opened with the St. Augustine Gospel Choir singing the spiritual “We’ve Come This Far by Faith.” St. Augustine Parish — the mother church for African-American Catholics in the nation’s capital — was founded in 1858 by free men and women of color, including some who were emancipated from slavery. The gospel choir sang at the 2015 White House welcome for Pope Francis hosted by then-President Barack Obama, the nation’s first African-American president. About 600 people attended the Mass. Cardinal Wuerl was the main celebrant, with Bishop Campbell, Washington Auxiliary Bishop Mario E. Dorsonville and six priests as concelebrants. “We make a visible and permanent declaration that, in ground made holy by their remains as a temple of the Holy Spirit, we mark and remember them,” the cardinal said. Cardinal Wuerl praised the witness of faith of generations of “African-American Catholics who kept the faith through eras of enslavement, segregation and societal racism,” and who remained “steadfastly faithful” to the Lord, his church and his creed. That remark drew applause from the congregation, which included people of diverse racial and ethnic backgrounds. Some African-American Catholics seated in a front section of the basilica wore colorful sashes made of kente cloth to reflect their African ancestry. Blessing the markers, he said, not only involved honoring those from the past, but also looking to the future.